The Arnolfini portrait, painted by Jan van Eyck in 1434, is one of the world's most famous paintings. The Arnolfini portrait, painted by Jan van Eyck in 1434, is one of the world's most famous paintings. This haunting gem of medieval art, a subtle and beautiful portrait of a wealthy Bruges merchant and his wife, intrigues all who see it. Is the painting the celebration of marriage or pregnancy, a memorial to a wife who died in childbirth, a fashion statement or a status symbol? Using her acclaimed forensic skills as an art historian, Carola Hicks set out to decode the mystery. She also tells the fascinating story of the painting's survival through fire and battle, and of its owners. 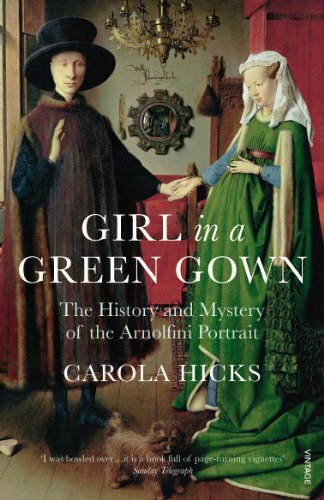 Uniquely, for a masterpiece of its age, its provenance can be tracked through every single owner - from the mysterious Mr Arnolfini via various monarchs to being an early star of the National Gallery in 1842- and these owners have a cameo appearance too, in this enthralling story of how an artwork of genius can speak afresh to each new generation.